It’s been too long since I’ve posted about Drew, but there have been many things to write about. Between planning the 5K, doctor appointments, and, frankly, just being so exhausted in this stage of pregnancy, I’ve become quite distracted. Drew is doing phenomenal in therapy. I have to admit, I was skeptical about doing therapy locally here as they were short on equipment and after being around so many other children in Florida therapy services who are going through the same surgeries and therapies, I thought Drew might feel alone and different being the youngest and most “different looking.” But, much to my surprise, Drew has really excelled and actually looks forward to therapy everyday. He is especially fond of his most frequent therapist, Sarah and while he interacts well with all therapists, he always voices disappointment when she’s not “working on him” (as he puts it). Maybe it’s because she likes to joke around with him, but it could be her blonde hair and good looks that attracts Drew. I guess the appeal of blonde hair and blue eyes is innate in boys! Though Drew struggles to focus more on play and less on exercise on occasion, Drew has made significant progress. He’s bearing weight well on both feet especially with the help of some rubber bands, craft foam and duck tape (naturally, duck tape is involved when fixing ANY problem). 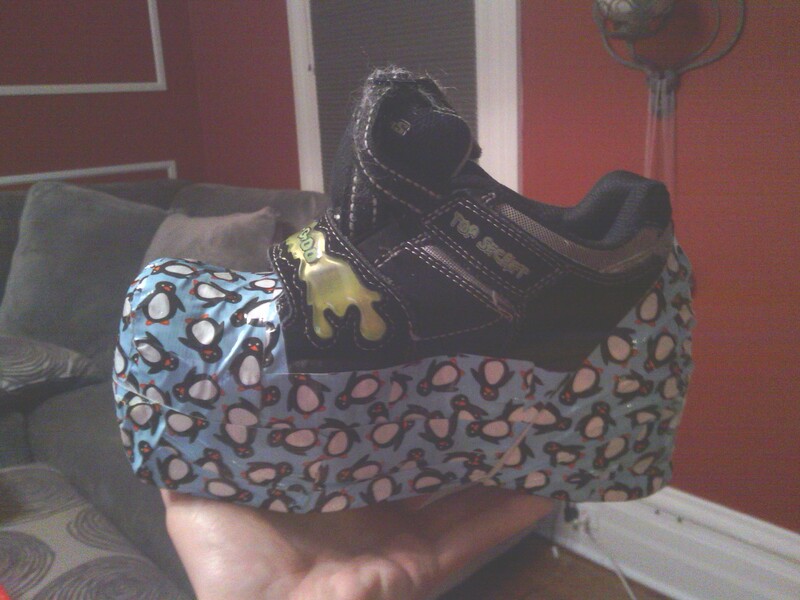 I feel like I may have a future in the shoe customizing business with my skillz. The problem was the fact that his fixator includes a standing foot plate which extends 2 inches or more beyond his foot leaving a significant difference in length next to his brace leg. So, with some crafty foam, some rubber bands, hot glue and duck tape, I applied my own little jerry-rigged shoe insert to compensate for the difference. It works surprisingly well! Another new addition to our collection of equipment is a new gait trainer. A gait trainer is like a walker, but it comes with a harness system to help support his weight until we can remove it. I ordered one online and had arranged for a local welder to perform some customizations as equipment typically is designed assuming the user has normal length arms. Well, that wasn’t the case for Drew. I was nervous about ordering it because they are really expensive ($500 – $2200) and seeing as I couldn’t find any store or therapy service that had the particular model that I saw online that I thought would work for me to test out, I didn’t want to have buyer’s remorse after spending that much money. But, I did find an online site that had a 30-day return policy so I excitedly placed the order. So, now Drew has a new red gait trainer to compliment his red wheelchair. And, Drew loves it. He walks so straight up in it that I have since changed my mind about having the welder customize it to add a handlebar for him to hold on to. I figured if he had incentive to lean forward to grab the bar, he would sacrifice the importance of good posture. So, it works perfectly even with his short arms. 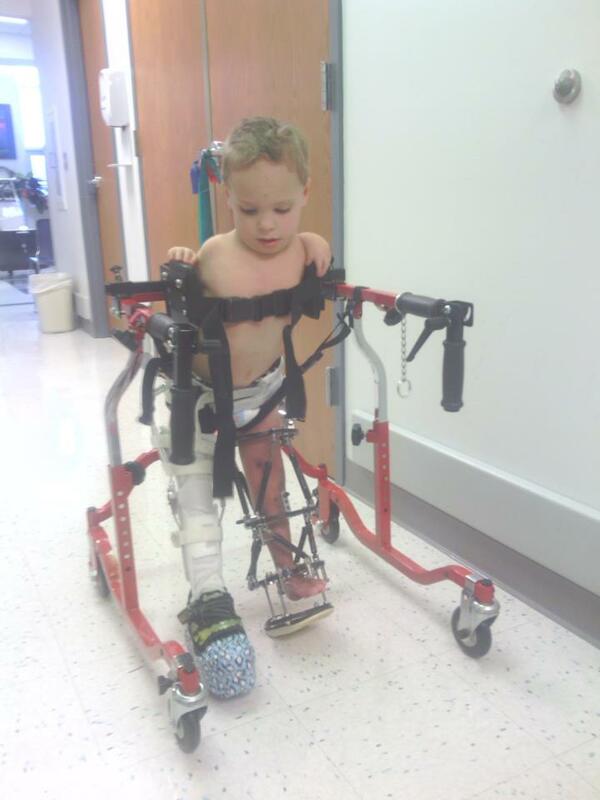 Here is a video of Drew using his gait trainer. Sorry it’s so unclear…it was recorded in a weird format that apparently loses clarity when uploaded to YouTube. iPhones, I thought they were, like, designed for this stuff?!? Anyway, during the video, you can hear Drew say, “I want to use this at home. I want to walk to my room!” Hearing those words from Drew is so rewarding. I just can’t tell you how comforting it is to hear Drew in all of his excitement and ambition to walk. If you remember, before the surgeries I had my worries and during Drew’s worst moments I wavered in our ddecision to go through all of this, but after 10 months of hell – of looking into Drew’s pained eyes as he pleaded that he didn’t want to walk and just didn’t want any more pain – hearing that he is excited about his new-found freedom makes it worth it. THIS is why we did these surgeries. THIS is why he had to be in pain for so long. So he can walk to his room. We still have a long ways to go as I’m waiting for the day that he can walk to his room without even a walker, but hearing Drew utter these simple words has restored my confidence and strength. I know that we can finish this. I know that that payoff is within reach. In other news, if you recall from my last post, we had visited Nashville for yet another consult with Drew’s cardiologist. Well, it has been confirmed: Drew will be scheduled for another open heart surgery this summer. The scheduler hasn’t called yet, but we’re looking at mid-July which is about when we think we’ll be done with Florida surgeries. They are going to do what’s called a Ross Procedure which involves taking the pulmonary valve and moving it over to the aortic side and replacing the original pulmonary valve with a tissue transplant. If I recall correctly, tissue transplants in the aortic valve have to be replaced more frequently or are just more complicated which is why they are chosing not to just do the aortic tissue transplant and avoid moving the pulmonary valve. But, he won’t require anti-rejection medicine like I thought and this could potentially be his last heart surgery. I don’t know if the fact that there is a heart surgery looming in the future has upped our anxiety or paranoia, but Nathan and I have been especially concerned about Drew’s heart health more so than usual. Drew recently started having these strange “episodes” of unexplainable and unprovoked “distress.” He’s had just a handful which start out as him just becoming upset. For him to become so emotional for seemingly no reason is strange, but even stranger is that Drew can’t tell us what is wrong or what is bothering him. He’ll tell us when he gains an ounce of composure, “I don’t know.” I’m certain he’s not in pain as anyone who follows this blog knows how much pain Drew has been in and how in tune with his sense of pain he’s in. He knows what pain is, more so than the average kid so I’m very confident that if he were in pain, he would plainly tell us. During his most recent episode, he actually displayed signs that he was having trouble breathing. It was almost as if he were hyperventilating. So, Nathan and I took him out to the ER and, of course, it was all over and done with before we even got out there, but since he’s had a few of these unexplainable episodes we carried on. They did a chest x-ray which was fine and the staff didn’t recognize any lasting effects so we came home pretty quickly. I did inform his cardiologist in Nashville, who had directly asked me if Drew was experiencing any respiratory issues during our last visit (which he was not at the time), in case these were the beginnings of symptoms of his worsening heart condition. Thankfully, these aren’t the types of respiratory issues they would expect with his heart condition, but since they are new he prescribed Drew Lasix to take 1x a day and Drew is now wearing a heart monitor that records his heart rhythms. If it recognizes any changes or if we see any symptoms such as these “breathing problems”, we can press a record button which will record the event and transmit it to the device supplier to share with the cardiologist. We aren’t sure how long he’ll have to wear it, but we’ll see what happens. And, FINALLY, the weather has warmed up! And, I am so happy that our neighbors are frequently outside to play as in the last 10-months Drew hasn’t gotten to spend a lot of time outside in all of the action. Drew’s bestie is outside and if we make eye contact, I can be sure he’ll ask if Drew can come out to play. Though I’m usually tired and the soft couch is calling my name, I can’t bear to keep Drew indoors given that he has so little opportunity to play with his peers now that he’s not in school. But, luckily for me, the neighbor boy keeps Drew really entertained so I enjoy laying myself out on the blanket and enjoy the warm sun and nice breeze. It’s actually quite relaxing! But, gosh, it will be so nice when Drew can look eye-to-eye with his peers, can retrieve toys that have been thrown himself, and play tag. It is a little sad watching Drew wait on the sidelines shouting out instructions as if he’s orchestrating the game. But, Drew seems to be taking it all in stride and he has a great time. So, if he’s happy then I’m happy. In other news, please help support Drew by joining our Walking the Walk for Drew 5K Run/Walk. Please visit www.drewunarmed.com/5K for more information about when and where and how to pre-register. You don’t have to live here to support Drew either. You can still pre-register and receive a t-shirt and a goodie bag and walk in your own area (psssst!! On any day you want and pssssst!! you don’t have to walk 5K!) to show your support. Here is the Facebook event for the 5K. Please “Join” and invite all of your friends. And, tell them to invite their friends. Help me get the word out about this event.